Vistitors to the Czechoslovak National House – more usually known as the Czech Club – in West Hampstead, London, will see in one of the dining rooms there a memorial plaque with the names of the Czechoslovak airmen killed while in RAF service during WW2. The plaque, in addition to these RAF airmen are also the names of 28 Czechoslovak airmen who died whilst serving with Armée de l’air in France in 1940 and also four of Czechoslovak airmen who died in Poland in September 1939. 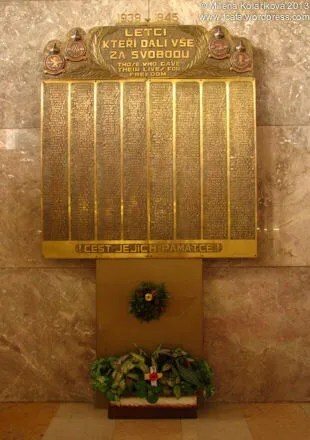 Likewise, vistors to the Military Museum, at Žižkov, Prague will see the an identical memorial plaque there. Firstly some background information regarding the origins to this plaque. 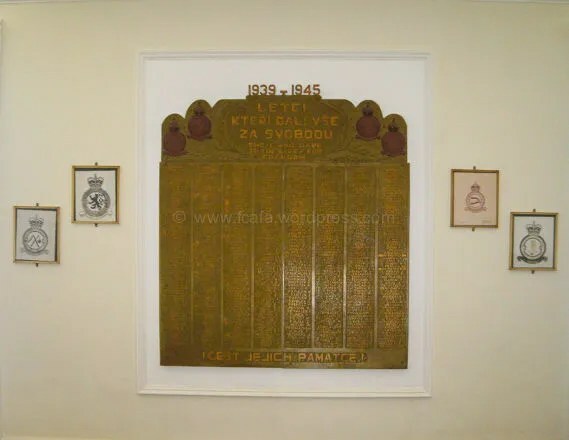 During WW2, the Czech Club was very much the spiritual home for Czechoslovaks serving in British military forces and originally at Bedford Place, London which was a short distance from Russell Square where the Czechoslovak Inspectorate where based. For these young men, far from home it was somewhere in London where they could dine on their national foods, drinks and meet other comrades on leave or passing through London between postings. In August 1945, the Czechoslovak RAF returned to their ‘liberated’ homeland, – despite the Russians being in occupation – and look forward to carrying on with their peacetime lives, some remaining in the Czechoslovak Air Force, whilst others, once demobbed returned to their civilian lives. Sadly the heroes welcome the received on their return was to be short-lived. In February 1948, following a putsch by the Communists, Czechoslovakia was now under Communist control and its destiny dictated to by Moscow. The Communists sought to ensure that any possible opposition to them was eliminated and those who had fought for the Allies during the war were considered as a danger. In many cases they were dismissed from the Czechoslovak Air Force, many being arrested by the StB, imprisoned or further persecution. However there were many who did not wait for this fate – they had escaped in 1939 to Poland or later through Slovakia to Romania, Yugoslavia and from there to France – so now they would escape again; some by taking aircraft and flying west either to the American Zone in Germany, or England, or by covertly crossing the border at night in the American Zone of German. Once they had been security vetted they usually made there way to England to start rebuilding their lives in the West. Some re-joined the RAF, others obtaining some civilian employment; often well below their trained skills. This was post war Britain, times were hard for all, food and clothing still rationed, cities and towns still with building destroyed by Luftwaffe wartime bombing and the new Cold War threat just beginning. It therefore became inevitable that for these exiled Czechoslovak former RAF airmen that there former wartime spiritual home -which in 1946 moved to its current location at West Hampstead – would resume its former role for them. Aware that back in Czechoslovakia, the Communists were actively trying to expunge the wartime Czechoslovak RAF airmen from their history books, these exiled airmen sought to ensure that there fallen would not be forgotten. This resulted in a brass memorial plaque being made listing, in alphabetical, rank-descending order, those fallen airmen and the most appropriate location was the Czech Club. Over subsequent years, by some of the names had hand etched ranks added adjacent to them. The plaque was to be for many years the only memorial in the world to the fallen Czechoslovak RAF airmen of WW2. At the time of its origins, it was very much in agreement between the exiled airmen that the rightful home of the plaque should be Czechoslovakia if and when the right circumstances arose. It was to be some 50 years before that became possible; in November 1989 the Velvet Revolution took place in Czechoslovakia, the Communist regime collapsed and a new democratic regime, with Václav Havel as its President was now in power. Finally the right circumstances had now arisen, but for the exiled airmen, now elderly and many of them having passed away, it was now a period of heart-searching as what should be done. There were very mixed feeling amongst them; some believed that they should respect and honour the original agreed intention; while others, did not want to see it go. A suggestion was made by Ben Chamberlain, a British schoolteacher. Whilst not related to a Czechoslovak airmen he had a very personal connection to them, in particular 310 Sqn; his uncle was John Boulton, a pre-War RAF flying instructor, who was initially seconded to 310 Sqn at Duxford when the Czechoslovak pilots began arriving on 12 July 1940. His role was to rapidly retrain Czechoslovak fighter pilots who had recently escaped from France to England, after the French capitulation, and these pilots were urgently needed as the Battle of Britain was just starting. Despite only a few of the Czechoslovaks speaking a few words of English and John (initially) not knowing any Czech the retraining was achieved and 310 Sqn declared operational on 17 August 1940. During this time John developed an admiration and affinity to these Czechoslovak airmen and requested to remain with them operationally. The RAF agreed to this request but sadly John was to be killed in a mid-air collision on 9 September 1940. However that Czechoslovak affinity was taken up post WW2 by his nephew Ben who became a well known and respected figure in the exile Czechoslovak RAF community. Ben’s suggestion to the plaque dilema was – ‘why not make a casting to keep in the club; the original can go back to Czechoslovakia, thus honouring the original understanding. This suggestion was met with approval by Marcel Ludikar, John Sigmund, Mirek Mirtl and Oldrich ‘Sula’ Soukup who had been delegated the role regarding the future of the plaque. Ben now continues with the story: ‘ The suggestion was agreed and I started looking for someone to do it. It very quickly became apparent that having a brass cast made would have been prohibitively expensive. I started asking about a resin casting and found a young man called Steve Cole who had a small one-man company called Articole in Hitchin. He agreed to do what was wanted and at a affordable price. Greatly daring I arrived at the Czech Club when it was shut, armed with screwdrivers and spanners. The plaque was in three vertical sections, bolted to a complicated strap iron framework which was, in turn, bolted to the wall. Thank god nothing was rusty and all the screws and nuts undid quite easily. I left the frame on the wall for the time being and drove the three brass plates up to Hitchin. A few weeks later Steve Cole rang to say all was ready. 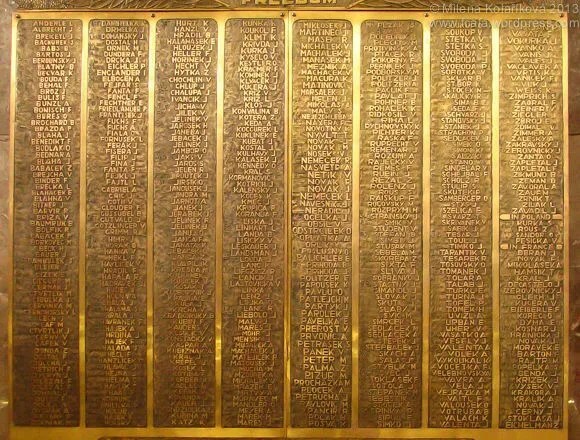 I collected the brass plates and the copies. I ought to say that the castings were made of a brass coloured resin – which had a rather greenish tinge. I took the original plates and also the iron framework to the Czechoslovak Embassy, LOndon, and brought the copies back to the Club. There were minor problems to do with slight distortions in the castings, so there was a certain amount of ‘fettling’ to do to get them to fit together. Now how to put them onto the wall? I deceided the best way to do it was to mount the three sections onto a sheet of ¾” plywood [it may have been ½”] which could then be fitted to the wall with many rawlplugs as it was quite heavy and I couldn’t risk it falling off onto someone eating. So, plywood obtained and cut to the right size and shape. The three sections were then offered up and the seven holes drilled in the plate and also the plywood. I then went to the Club on a Sunday afternoon [I think], fixed the plywood sheet to the wall securely and then screwed the panels onto the plywood. And there they have been since then. The only things left off from the original plates, as being too difficult to do and also not really being necessary, were two small model aeroplanes which stuck out on a stand from the top of the memorial. At the time the plaque was originally produced, resources available to research and identify the fallen Czechoslovak RAF airmen was limited when compared to resources available today, and so it was inevitable that some errors would occur. Some of these were due to naming errors held on the files at the Commonwealth War Graves Commission archive others are due to incomplete records being available at that time and simple human errors. What is very noticeable on the plaque is that one name has been removed – that of Sgt Augustin Přečil who was thought to have been killed when his Hurricane Mk 1 W9147 PA-A did not return from a training flight on 18 September 1941 when with 55 OTU; it was believed that his Hurricane had crashed into the North Sea. Unbeknown at that time was that he was a Gestapo informer, who instead of flying the intended training flight from Usworth to Bastogne, flew to Belgium, landed at Ortho and subsequently worked for the Gestapo in Prague, providing them with information on Czechoslovaks serving in the RAF and often helping to interrogate captured Czechoslovak RAF airmen. His treason was exposed at the war ended and was captured and executed in Prague 1947. Article last updated 6 July 2016. This entry was posted in Information, Memorial, Not Forgotton. Bookmark the permalink. 3 Responses to So why are there two? Lovely article. I didn’t know this story even though my father – Rudolf Polednik, who later changed his name to Chapman when he opened a butcher’s shop in Bramhall, near Manchester, was manager of the Czech Club in West End Lane after the war. Thank you for telling it. I found this article when researching my great grandfather (Rudolf polednik). I am the daughter of Sophie Polednik, who’s father is your father’s son from his first marriage. If you have any more details on Rudolf I’d love to hear them as it would help me greatly with my research.